•	Pistol •	Ammunition: 1000 rounds •	Eye & Ear Protection •	Holster and magazine pouch (No nylon holsters) •	Clothing appropriate to weather •	Gun Cleaning gear •	All equipment, including pistol, is available is available for rental. 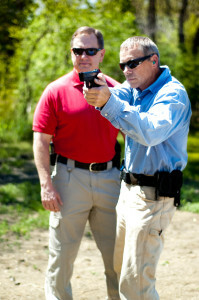 Tom Russell’s 5.5 Day General Pistol Class. This is Colonel Jeff Cooper’s General Pistol Class. If you want to spend 5.5 days learning safety, learning marksmanship, gunhandling, the Combat Mindset, the science of stopping power, etc. with one Colonel Cooper’s Master Instructors, then this is the time. All equipment, including pistol, is available for rental.